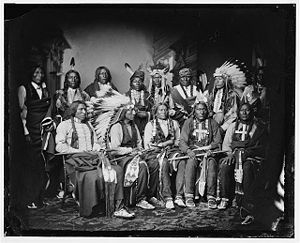 (Imaginary Press Release) The immigration crisis in the United States took an unexpected turn today when Native Americans launched a lawsuit to deport all European descendants from the US back to their homelands. Following the recent Supreme Court decision on immigration, leaders representing all the major tribes gathered together at Little Big Horn to announce an impending lawsuit. They are seeking a lawsuit to remove all European Americans whose ancestors emigrated to this country illegally during the past 300 years, claiming that they had illegally squatted on tribal land, brought a plague of drug and alcohol abuse, took jobs that unemployed Native Americans could do, like being CEOs, equipment managers for basketball teams, and investment bankers, and ruined their livelihoods by killing off all the buffalo. They are asking the court to uphold their legal request that requires all Europeans to carry identification cards and wear moccasins except in extremely cold weather. They also have suggested that Reservation police be able to check identity and arrest Senior Adult Caucasians at Casinos if they have probable cause to think they are here illegally. The Europeans must return all stolen lands and go live on a reservation while their cases are being deliberated. If deported, they will go to the end of the line, which is said to be in Iceland and that they may come back in ten years. Descendants of Cochise, Red Cloud, Sitting Bull and Geronimo have hired the Manhattan firm of Dewey, Cheatum and Howe, famous legal counsel for NPR’s “Car Talk,” to lead the dream team. They will be joined by lead attorney and member of the House of Representatives Chief Enormous Bull as they argue their motion. The motion blames Squanto for helping the Pilgrims, who kidnapped him and took him to England while his tribe was wiped out by Pilgrim diseases. Squanto, they contend, did not have authorization to permit them to land in the first place. 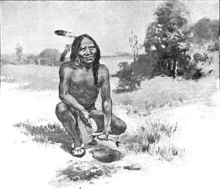 The Indians had planned to build an enormous wall around Plymouth Rock but construction had not begun when the immigrants arrived and began squatting on the land. In a related move, the Geico Cavemen said they would file an injunction blocking the Native American motion as their ancestors likely preceded them and should also be removed. While their numbers are small, they have considerable insurance assets to leverage for a long legal fight. Neither group has said specifically if the motions would apply to all Caucasian Americans, or would only affect those whose ancestors actually took Indian lands. Both groups said they would be willing to negotiate a settlement, and neither had interest in taking Manhattan back, and said that Arizona could remain as a reservation for whites until arrangements to move in with relatives could be made. The American Bar Association said it looks forward to the years of billable hours that this action implies. Leaders in China said whoever wound up with ownership of the country would be responsible for its current and future debts. Europeans announced a counter-suit denying the return of the descendants until they could prove that they would be good citizens and not a threat to security. Mexican drug cartels protested the removal of their largest customers citing exorbitant shipping and transportation costs. Meanwhile, Alabama and a dozen other states said they would begin deportations immediately, whether there was a country to take them or not. In the absence of a place to go, white people will be given large flat barges stocked with bottled water, Spam and saltine crackers, cable television and country music CDs while they wait until a country will receive them. The suit has specified that those being placed on the reservation will travel by Greyhound bus along the Trail of Tears. A spokesman for the Euro-Americans protested the move, citing the damage it would cause to families and especially children, and members of Congress met through the night and said because of the urgency of the matter that Immigration reform could be ready as early as Tuesday. The President said he would rush back from vacation to sign the bill, which would resolve the situation. “This affects millions of voters…er, people. We have to fix this.” Observers say it may be the fastest action of this magnitude that the Congress has ever achieved other than declarations of war, voting on raises for Congress, and motions of appreciation for professional athletes. Posted on July 16, 2012, in Citizenship, Culture, Ethics, Immigration, Leadership, Politics, Race and tagged Culture, deportation, Ethics, immigration, immigration reform, Native Americans, race, Supreme Court. Bookmark the permalink. 4 Comments. This post should be sent immediately to Fox News, Rush and Glenn, who will broadcast it with their usual commentary, get everyone excited, and then maybe REAL reform would take place. Great thinking, Gary! Thanks Sharon. I so appreciate your perspective. It’s a mess! Your absolute best (and there have been many great ones) post yet. I’m adding to FB page now.